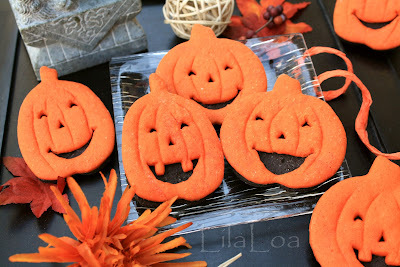 On this exact day last year, I had already posted ELEVEN Halloween cookie posts (and 3 general Fall-ish type posts.) 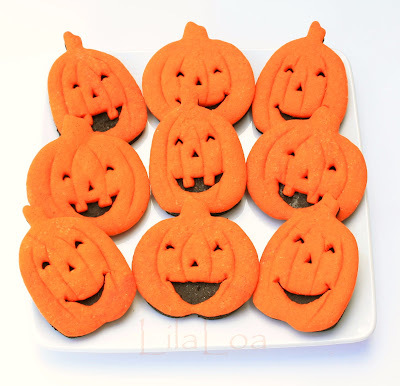 I was making Halloween cookies in August. I'm trying to hold back this year. Mostly because I'm superficial and I care what other people think and I really, really, really don't want to be the weird kid on the playground that nobody wants to play with because they are trying to convince all the other kids that they are The Master Dreamer and that everyone else is just a pawn of their imagination. And by that I mean....IS there such a thing as too many Halloween cookie posts? 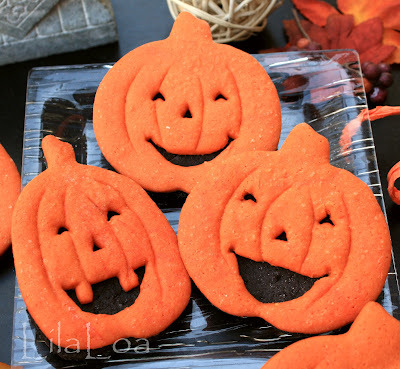 Because, I'm gonna tell you right now that I LOVE HALLOWEEN COOKIES!! They are by far my most favorite kind of cookies to make. I could make them year round. I *might* have made them year round already. I do not know why I like Halloween so much. Its kind of a scary holiday. Its like an unwritten Halloween rule that you're supposed to scare someone. But not little kids. Halloween is not for scaring them. Halloween is for giving them candy and sparkles and little jars of happiness that aren't really jars but are actually pumpkin shaped plastic containers filled with sugar that their parents will secretly be stealing when they think their children won't notice. But they DO notice, so don't take the Kit-Kats. They've already counted them and they will KNOW if one of them is missing. Take those weird orange and black peanut butter taffy candies. Nobody really pays any attention to those poor little dears. They are like The Master Dreamers of the candy world. And they never really had a chance. They don't have flashy packaging or catchy marketing jingles. They don't even have a memorable name. Or even taste good. Actually... Why DO they keep making those candies? Are they just trying to torment children? Its like a sugar rock. You think you have a bag full of deliciousness and candy, but it turns out that someone just stuck peanut butter sugar rocks in your bag AND you carried them around all night. I bet they are at home laughing their little Master Dreamer heads off at all the poor children walking around with their poor little bulging bags of not-candy. Hmmm. Maybe that's why they call it Trick-or-Treat. And in other news...you should make these cookies. They are easy and fun and quick and do not require orange and black wax paper or weird peanut-butter taffy flavoring. You can add those if you want to though, I guess. I mean...it's your life. I won't judge you if you put weird candy flavoring in your cookies. Well, I might actually. I mean...it's my life too, you know. 2. Roll your dough a little thinner than usual. 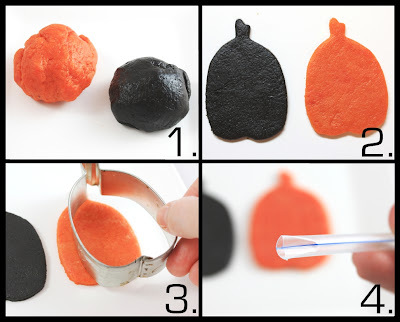 Cut out one black and one orange pumpkin for each cookie. 3. 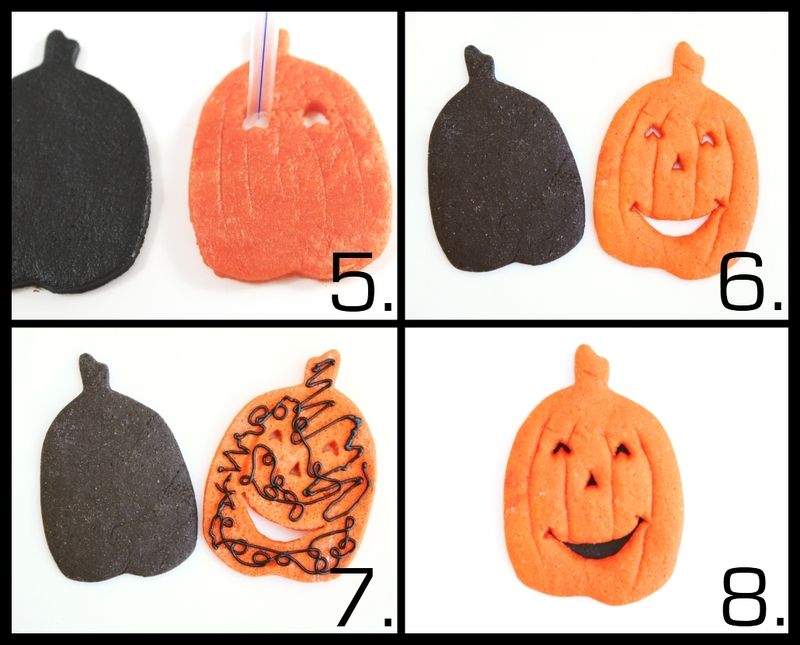 Use the side of the cutter to make lines in the orange pumpkins. 5. Use the bended up straw to cut eyeballs in your cookie dough pumpkin. I bent the other side of the straw into a triangle to cut out the nose, and used one of my icing tips to cut out the mouth. OR -- You could use THESE CUTTERS or THESE CUTTERS and forget about bending straws entirely! 6. Bake. They will need slightly less time to bake since you rolled them thinner. 7. Put icing on the back of the orange pumpkin. You can use royal icing, or butter cream, or that highly pressurized easy-frosting-in-a-can I just saw a few days ago. This would be an excellent time to try out the Pumpkin Spice Whipped Butter Cream (<--Click) if you haven't already. 8. Press the orange cookie on to the black cookie. Repeat as desired. I tried something new with the cookie dough this time. (I can't help it. I have a disease where I can't leave a recipe alone.) (It's a real thing.) (No, it's not.) (I also have a teeny lying problem as well, apparently.) I used THIS RECIPE (<--Click.) I used brown sugar instead of white sugar and left out the baking powder (because brown sugar spreads/puffs more than white sugar.) THESE COOKIES ARE DELICIOUS. And when paired with the pumpkin spice butter cream, they are absolutely irresistible. Seriously, don't come back here 20 pounds from now and start hating on me. I warned you.